Lyon has a thriving Irish pub scene in Vieux Lyon and Croix-Rousse, making it the perfect place for a decidedly-Irish night out. 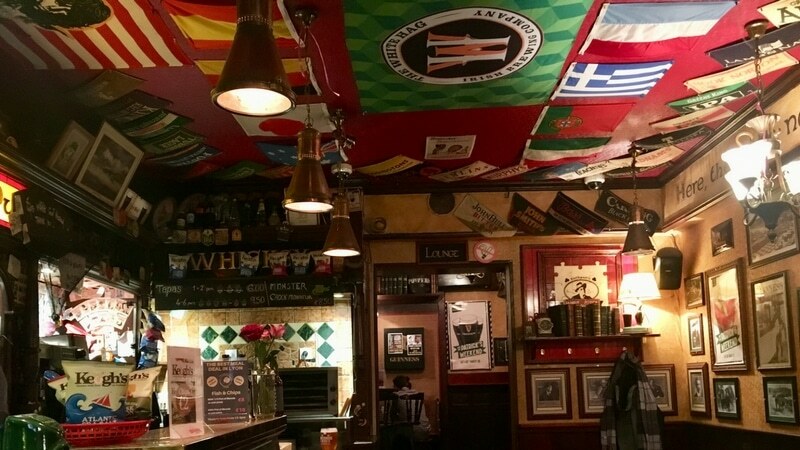 Full of food, darts, sports games, and a whole lot of Guinness, these pubs in Lyon have everything you could ask for and more with an ambiance plucked straight out of Ireland. 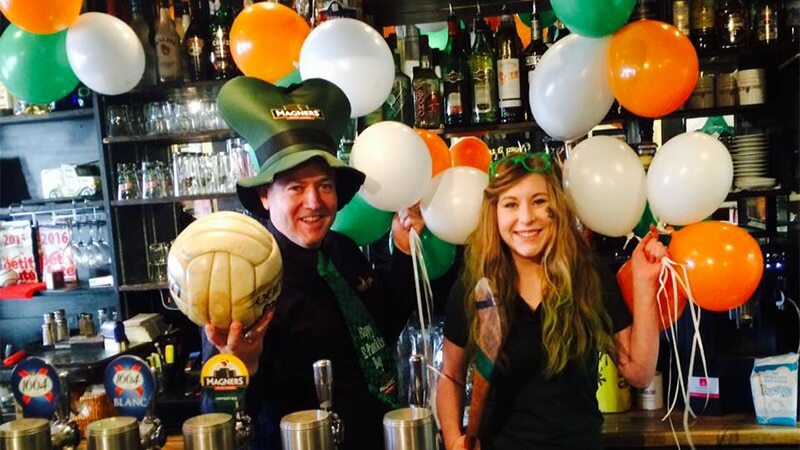 And they are of course the best places to celebrate St Patrick’s day on March 17. 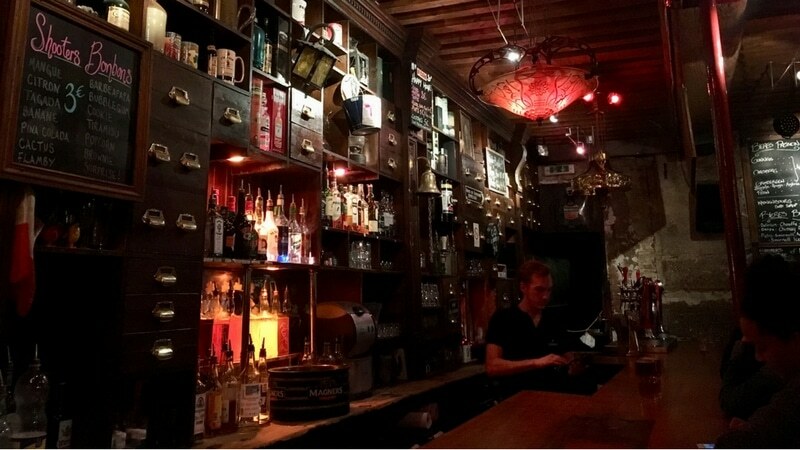 At the end of Rue Saint-Georges, the Antidote is currently the oldest Irish pub in Lyon. Created in 1992, it’s been run for 16 years by Franck Binachon, who has kept the Irish decoration (Guinness advertising, flags…) and the wooden furniture typical of pubs. 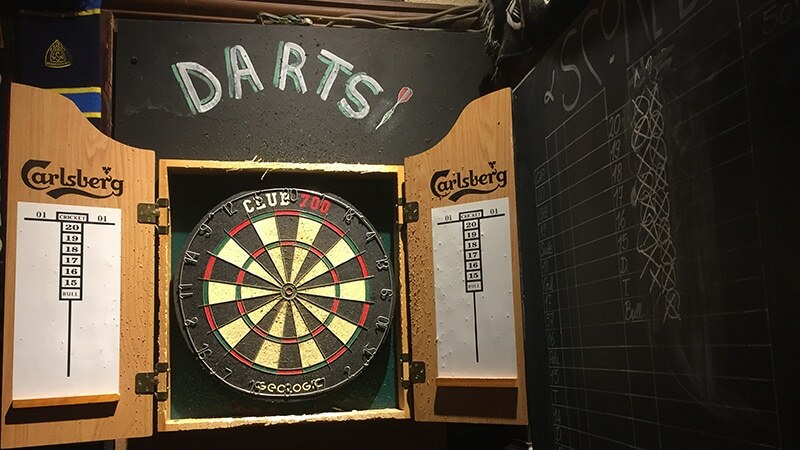 You can play darts at the Antidote Pub on Rue Saint-Georges in Lyon. There is Guinness on draught, of course, as well as Smithwicks, Magners Irish cider, and a range of Irish and Scottish whiskey. You can also play darts and attend an Irish music concert on Tuesday nights. No food available, but the pub does broadcast football and rugby games on the regular. “The Antidote has a large capacity. It’s perfect for groups,”says Binachon. That evening, he served pints to the team of the Lyon Museum of Contemporary Art. The occasion? An exhibition at the museum entitled Antidote, because the artist Adel Abdessemed met his wife in the pub 25 years ago! Pint of Guinness: 5 € before 8 p.m. (6,5 after). 108, rue Saint-Georges, Lyon 5. Open every day from 6 p.m. to 1 a.m. Neck and neck with the Antidote on the longevity scale is the St. James. 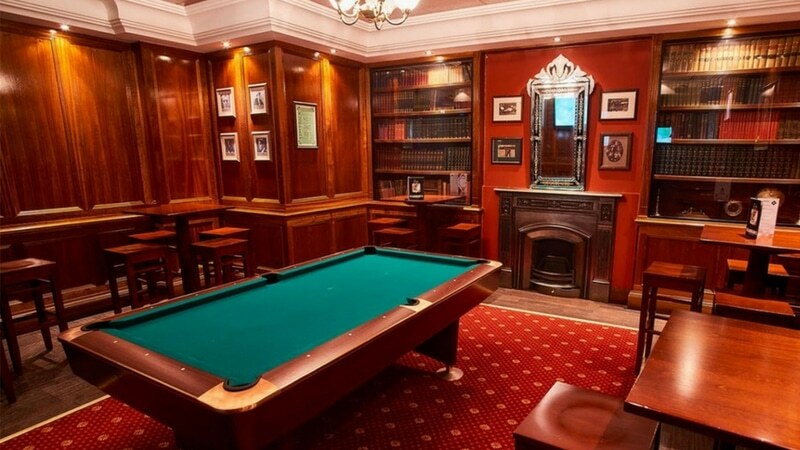 Head to the St. James for a round of pool and an early opening time. 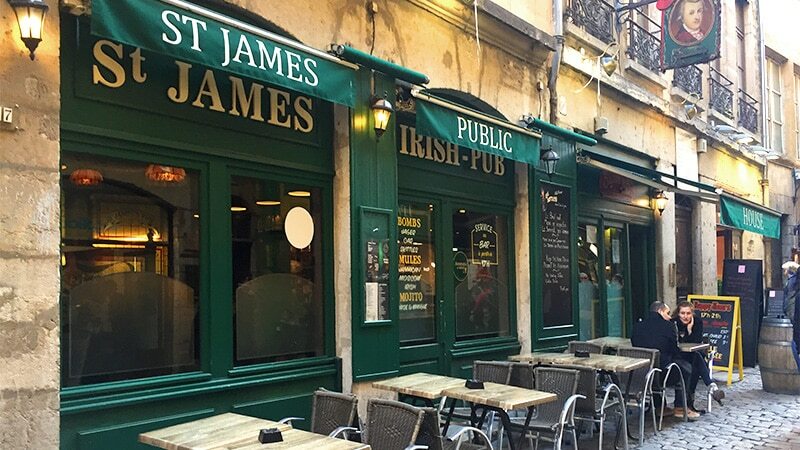 The St. James has been around since 1992, making it a popular hang-out for the local Lyonnais crowd as well as some expats and students. It’s also home to the self-described “sexiest Irish bartenders ever” and beers like Brooklyn Lager, Paulaner, and Brewdog as well as all the usual pints. Head downstairs for some pool or get the party started early with their 2 p.m. opening time. Be sure to stop by on St. Paddy’s Day, the biggest day of the year, when the bartenders say they turn the place into the most efficient conveyor belt of Irish beer in the city. 19 rue Saint Jean, Lyon 5. 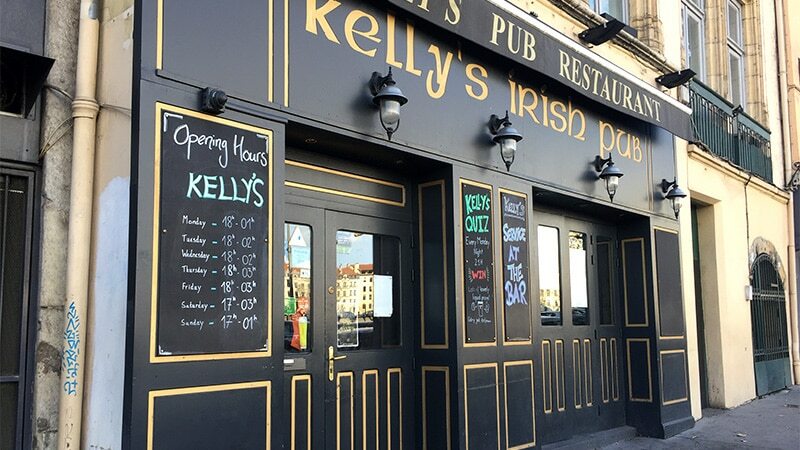 Open every day from 2 p.m. to 2 a.m.
A more recent addition to the Irish pub scene, Kelly’s opened in 2009 and is a favorite of the young, working Lyonnais, as well as a lot of international students. Kelly’s Pub offers one of the biggest food menus if you’re hungry. With Guinness and Kilkenny on tap, Kelly’s has a decent range of Irish beers and whiskeys in stock, but also offers some less easily found Belgian beers like Liefmans and Triple Karmeliet. They also have a full menu of tapas, burgers, and wraps so you can come in for a bite and stay for a pint. There’s always something happening at Kelly’s, with live music twice a week on Thursdays and Fridays, sports games on the television, and pub quiz Monday nights. 12 quai Romain Rolland, Lyon 5. Open Mon 6 p.m.-1 a.m. Tues-Wed 6 p.m.-2 a.m. Thurs-Fri 6 p.m.-3 a.m. Sat 5 p.m.-1 a.m. Sun 5 p.m.-1 a.m.
There’s no Guinness on draught at Fleming’s but Murphy’s, the other popular Irish beer brewed in Cork, in stout and Irish Red version. Fleming’s pub green facade in Vieux Lyon. 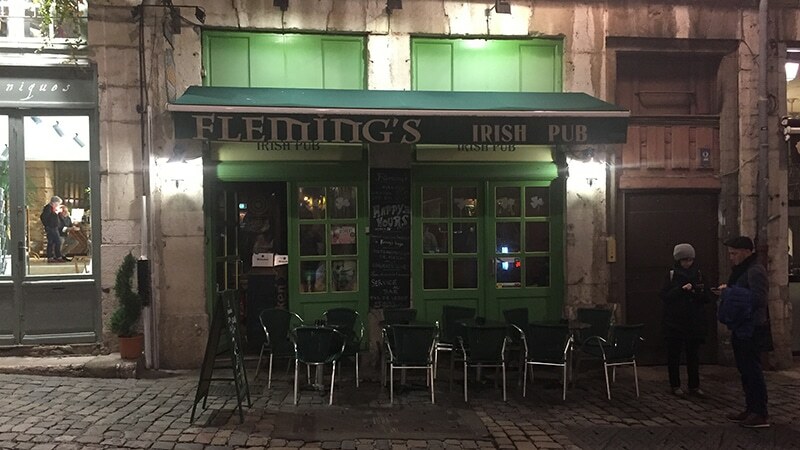 Fleming’s is a small Irish pub in the heart of Old Lyon recognizable by its green facade. It broadcasts football and rugby matches on a very large screen, and with sound! The pub regularly organises concerts, mojito parties, and blind musical tests for its mostly young clientele. It also has a nice little terrace facing the Protestant Temple next to rue St-Jean for when the weather is warm and the nights are long. Pint of Murphys: 4,5 € (happy hour). 2, rue de la Loge, Lyon 5. Open Mon-Fri 5 p.m. to 1 a.m. Sat and Sun 2 p.m. to 1 a.m. The storefront near the Cathedral St-Jean sets the tone immediately : the James Joyce is a traditional Irish pub. Opened ten years ago, it has become a landmark stop for visitors looking for a casual drink between friends, or “family,” as the owner likes to say with a cup of Irish tea in his hand. Every piece hung up on the wall was brought to Lyon from Ireland. The James Joyce offers the best Guinness in Lyon (according to many) and the largest selection of Irish draft beers imported from small Irish breweries, ranging from 4€ to 7€ a pint. The Devil’s Bit will satisfy anyone looking for an authentic Irish apple cider, while the deep selection of whiskey includes all the variations of the popular Jameson. A shot of Jameson for an extra 2€ to any pint of beer (evening special). 68, rue St-Jean, Lyon 5. Open every day from 11:30 a.m.-1 a.m. (3 a.m. on Friday and Saturday). Located on the first slopes of Pentes de la Croix-Rousse, facing the National Opera de Lyon in the 1st arrondissement, Flanigan’s has turned into one of the most popular Irish pubs to spend an evening with friends. Opened in 2008, it is a sizable place for pub standards, with two main rooms on the first floor and one more upstairs with a snooker room. It is possible for anyone to privatise the snooker room for free, as long as you consume pub products. 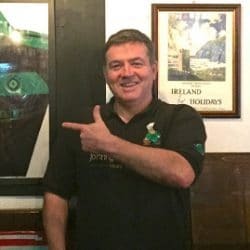 The snooker room gives the Flanigan’s a unique taste of Ireland in Lyon. Flanigan’s has a large selection of bottled beers, with more than a dozen coming from Belgium, as well as many different whiskeys from Scotland, Ireland, and Japan. The pub also hosts a whiskey tasting once every two months. The pub provides a large menu of traditional food such as the Flanigan’s Burger, available for €12 (and €10 during happy hours), and the unmissable fish and chips. DJs on weekdays and concerts on weekends bring live music to the table, and the pub is well known for its Monday quizzes and karaoke nights on the last Thursday of the month. Johnny Walsh’s is classic Irish through and through. It takes after the historic pubs of Ireland with no food and live music almost every night. Because it opens at 9 p.m. the party starts late and runs into the early morning hours. The party starts late at Johnny Walsh’s, one of the most classic Irish pubs in the city. 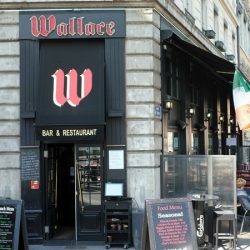 Opened in 1995, it’s up there with Antidote and St. James as one of the oldest Irish pubs in Lyon and home to a lot of regular locals. Never fear, though! You can still find plenty of English-speaking students and tourists popping in. Stop by for a late-night pint, open-mic, or some good-old karaoke. There’s a Happy Hour on blonde beer from 9-10 p.m. daily and plenty of local bands throughout the week. 56 rue Saint-Georges, Lyon 5. Open Tues-Sat 9 p.m.-3 a.m. Continuing with the J’s of the Irish bar scene is Johnny’s Kitchen. 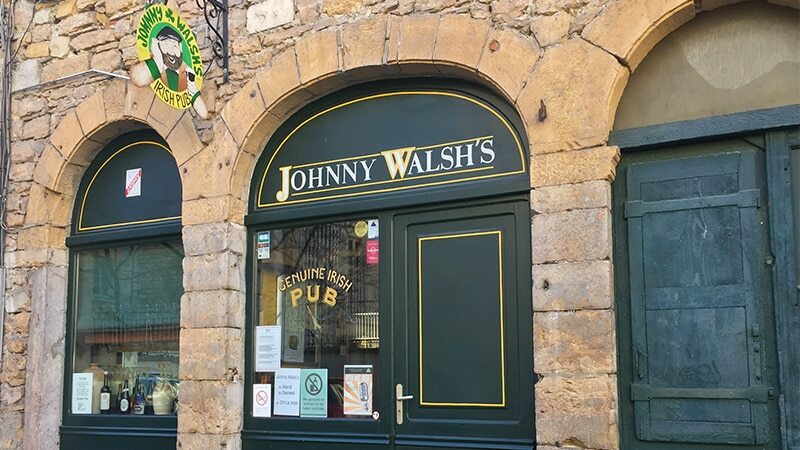 Home to the French-Irish Association of Lyon (A.F.I.L) and the Gaelic Football Team, Johnny’s is always full of English speakers from all over the world and all walks of life. It’s a great place to practice your English if you’re learning too. 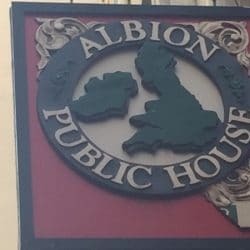 The only place in town with jacket potatoes, they offer a full food menu with daily specials, live music, and every sports game you could ask for. Home to tons of Irish and craft beers, the taps of the moment include Vedett, Belhaven, Palm, Mc Douglas, and plenty of others. Oh, and Guinness of course! Their most outrageous night of the year is of course St. Patrick’s Day, when the furniture goes up on the roof, the windows and doors are taken down, the street parking is taken over, and the party runs until dawn to the sound of all-night music. 48 rue Saint-Georges, Lyon 5. Open Sun-Thurs 12 p.m.-1 a.m. Fri-Sat 12 p.m.-2 a.m.
Want to join a crowd of young locals shooting darts ? The Shamrock might your place. This Irish pub, a pillar of Rue St-Catherine right behind the Place des Terreaux, has a festive atmosphere straight out of the Middle Ages and a cavernous feel to match with one of the highest ceilings you’ll probably ever find in a bar. The massive wall behind the bar of the Shamrock in Lyon. The Shamrock is renowned for its cheap beer : get a pint for as low as €5 (or even €2,5 for students!) during happy hours. 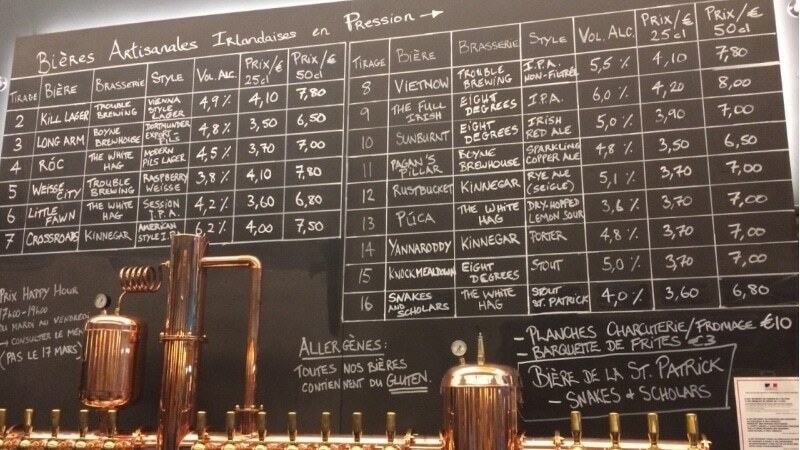 Pint of blonde beer: 2,5€ for students between 6 and 8 p.m.
15, rue St-Catherine, Lyon 1. Open every day from 6 p.m.-3 a.m. 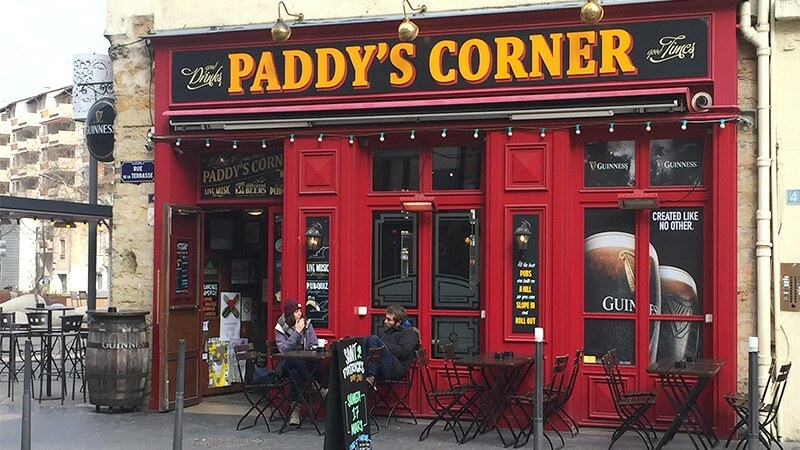 Opened in 2008 at Place des Tapis, just a stone’s throw from the Boulevard de la Croix-Rousse and the Croix-Rousse metro station, Paddy’s Corner quickly became a local institution. 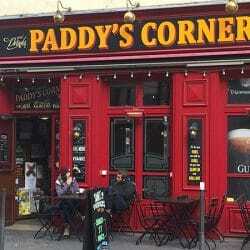 Paddy’s Corner is a good place for both friends and family. Head there for coffee in the morning, with your family in the afternoon and and with friends for a cocktail, Irish whiskey, or beer (15 on tap). If there are too many people, which often happens, you can find a table on the large terrace, heated in winter. Paddy’s regularly organises concerts on Thursdays, and its quizzes every other Tuesday are very popular. Football and rugby matches are the standard on the big screen. 4, rue de la Terrasse, Lyon 4. Open Sun-Wed 8 a.m. to 1 a.m. Thu-Sat 8 a.m.-2 a.m.
Accasbel strays from the traditional Irish pub feel but keeps the Irish heritage with its combination bistropub. Accasbel has a wide selection of Irish craft beers to choose from. They have 16 beers on tap from some of Ireland’s best microbreweries, with options ranging from IPAs to Irish Red Ales to stouts. And the owners are on hand to explain everything in English to beer novices. But Accasbel doesn’t stop with beer. Their French-Irish restaurant menu includes Irish classics like Angus steak, burgers, pork dishes and seasonal specialties made with the freshest ingredients. Stop in for a refined taste of Ireland in the heart of Lyon. 20 Place Carnot, Lyon 2. Restaurant open Tues 7:30 p.m.-10 p.m., Wed-Sat 12 p.m.-2 p.m. and 7:30 p.m.-10 p.m., Sun 11:30 a.m.-3 p.m. Bar open Tues-Thurs 5:30 p.m.-12 a.m. and Fri-Sat 5:30 p.m.-12 a.m.